Ole Miss junior tight end Evan Engram had 83- and 46-yard receptions in last season's 31-17 win over Mississippi State. Midway through the third quarter of last year's game against Alabama, Ole Miss tight end Evan Engram had a 50-yard reception that helped turn a 14-3 deficit into an eventual 23-17 triumph over the Crimson Tide. Engram had a 50-yard scoring reception a month later in the Rebels' heartbreaking loss to Auburn and closed the regular season with 83- and 46-yard receptions in a 31-17 win over rival Mississippi State. With a buffet of selections from last season — there was also a 28-yard score in a 34-3 win over Tennessee — does Engram have a favorite play? * Fun fact: Three coaches in Ole Miss history have produced 10-win seasons: Johnny Vaught (1955, ’59, ’60 and ’62), Billy Kinard (1971) and David Cutcliffe (2003). "Anytime I make a play across the middle, it's big confidence-wise," Engram said last week at Southeastern Conference Media Days in Hoover, Ala. "It's hard to go across the middle, and a lot of guys shy away from it, but that's kind of my specialty. I like getting in the middle and making first downs. "I look forward to making big plays across the middle for our team." 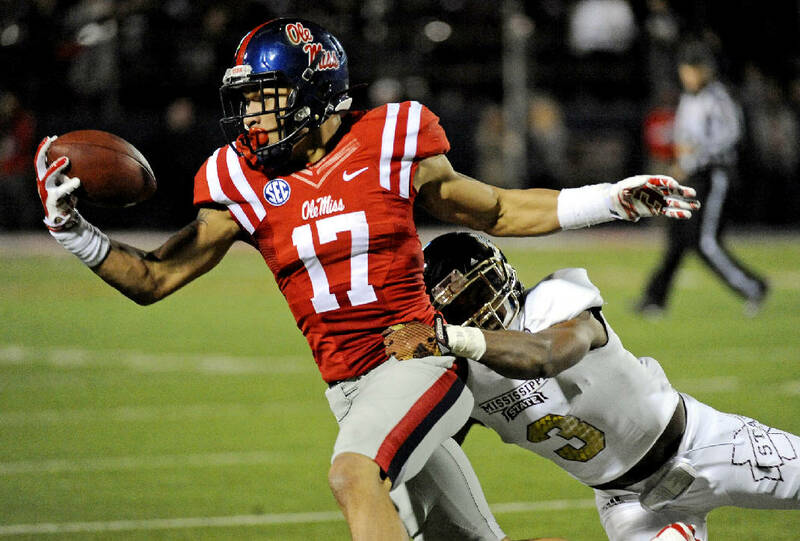 Engram is proof Ole Miss coach Hugh Freeze doesn't just develop the five-star prospects. A 6-foot-3, 227-pounder from Powder Springs, Ga., Engram was overlooked in a 2013 signing class that contained the elite trio of defensive end Robert Nkemdiche, receiver Laquon Treadwell and offensive tackle Laremy Tunsil. The Rebels also signed nine Rivals.com four-star recruits that year, including safety Tony Conner and running back Jordan Wilkins, but Engram was a three-star recruit and the No. 34 tight end prospect nationally. As that standout class enters its third season in Oxford, Engram has done an excellent job stating his case as the most productive of the bunch. After making five catches for 61 yards in his collegiate debut on a Thursday night at Vanderbilt, Engram wound up collecting six starts as a freshman, as well as 21 catches for 268 yards and three touchdowns. He added significant numbers last year as a sophomore, raking in 38 receptions for a team-high 662 yards and two scores, with his 17.4 yards per catch leading all tight ends nationally. "His impact is far beyond the field," Freeze said. "He's one of those guys that you look at and say, 'Man, I wish we could model this young man as a student-athlete as far as the classroom, on the field and his personal life.' He's just an outstanding leader for us who brings it every single day. "He's a very difficult matchup that we think makes us more difficult to defend when he's on the field." Engram, who was an All-SEC selection last season and a semifinalist for the John Mackey Award, caught passes the past two seasons from Bo Wallace. This year, three quarterbacks are vying to be Wallace's successor, with Clemson transfer Chad Kelly expected to get the nod over Ryan Buchanan and DeVante Kincade by the time the Rebels open the season Sept. 5 against Tennessee-Martin. Kelly, the nephew of former Buffalo Bills great Jim Kelly, played last season at East Mississippi Community College. "That's going along as smooth as it can be," Engram said. "All three of those guys are working their tails off, and they all look good. They're building leadership, and they're building chemistry with the offense. We're going to rally around them in camp, and we're looking forward to a successful year no matter who it is." Treadwell, who led the Rebels with 48 receptions, should be fully recovered from the gruesome leg and ankle injuries he suffered last season against Auburn. Cody Core is also back at receiver after amassing 41 catches for 558 yards and six scores a year ago, and joining the mix are touted freshmen Van Jefferson and DaMarkus Lodge. Jefferson and Lodge were top-15 Rivals.com receivers in the 2015 class, with Jefferson coming out of Ravenwood High in Brentwood, Tenn.
"They come to work every day on time and do the little things right," Engram said. "They're doing all they can to learn as much as possible before camp starts. They'll be swimming a little in camp when the playbook is thrown at them, but it's definitely impressive to see them working as hard as they are." Ole Miss raced out to a 7-0 start last season and was in the picture for the inaugural four-team playoff until the 35-31 loss to Auburn. The Rebels had their talent dwindled by injuries down the stretch and lost four of their last six games, including a 30-0 shellacking at Arkansas and a 42-3 succumbing to TCU in the Peach Bowl. Engram said the team feels refreshed now as players continue to get healthier, though the goal of winning the program's first Western Division title will be challenged this year with visits to both Alabama and Auburn. "We have no choice but to go in there and win," Engram said. "We want to win all our games and have set high, high expectations. We don't show up to work just to go 9-4. We're not just satisfied with 9-4, and we're not just satisfied beating Alabama. "We want to be on the big stage, which is playing for an SEC and a national championship."